Qualcomm on Wednesday continued its legal assault against Apple with a pair of filings alleging infringement of in-house and purchased patents, including intellectual property developed by defunct portable device maker Palm. In a first complaint lodged with the U.S. District Court for the Southern District of California, Qualcomm asserts five patents, four of which originate from Palm. The last piece of IP comes from a patent portfolio formerly held by TouchTable, an arm of tech firm AppliedMinds. As it applies to former Palm technology, Qualcomm's lawsuit asserts infringement of U.S. Patent Nos. 8,683,362, 8,497,928, 7,844,037 and 9,203,940. As described in U.S. Patent and Trademark Office filings, the '362 patent describes a card-based multitasking interface that found its way into Palm's webOS, which Qualcomm views as a progenitor of modern smartphone operating systems. 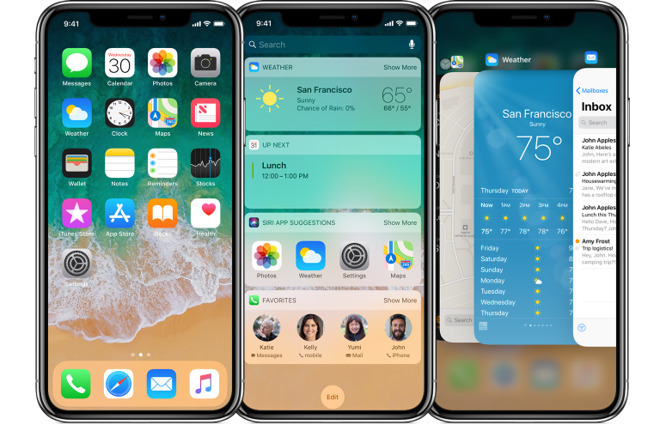 Apple's iOS, including the latest iOS 11, relies on similar graphical user interface assets to manage multiple app instances. Beyond app multitasking, the '928 patent deals with camera focusing techniques, specifically methods of deploying a tap-to-focus system in portable devices that utilize a large screen as a digital viewfinder. The '037 patent describes methods of responding to an incoming call with a text message instead of sending it to voicemail or declining it altogether. Finally, the '940 patent details a multi-use power button capable of turning a device on and off, silencing incoming calls, activating a display and more. Apple's iPhone devices have incorporated similar features over the years, Qualcomm says, and are thus in infringement of the IP. The TouchTable patent, U.S. Patent No. 8,665,239, dates back to 2012 when AppliedMinds founders and former Disney employees Daniel Hillis and Bran Ferren dreamed up a large table device with embedded touchscreen. Dubbed the TouchTable, the equipment was designed to enable collaborative work between two or more users without the need for input accessories like mouse and keyboard hardware. In particular, Hillis and Ferren developed a number of gestures that allowed users to manipulate onscreen images. Most notably, the device understood pinch-to-zoom gestures now common to Apple devices. In a second complaint, Qualcomm asserts a total of six patents — U.S. Patent Nos. 8,971,861, 7,834,591 8,768,865, 8,229,043, 8,447,132 and 9,024,418 — covering a range of technologies from power management to machine learning. Along with the two lawsuits, which join a third filed earlier yesterday, Qualcomm said it plans to lodge a complaint with the U.S. International Trade Commission today, reports the San Diego Union Tribune. The legal volley arrives just one day after Apple filed its own countersuit claiming Qualcomm's Snapdragon processors infringe on eight owned patents. General Counsel Don Rosenberg in a statement said today's Qualcomm filings are not a direct rebuttal to Apple's complaint. "You can't react that quickly to file lawsuits," Rosenberg said. "We were in the process of filing three new district court cases in San Diego today, and one new ITC case in Washington, D.C. Those involve a group of 16 patents that are additional to the ones we have already sued them on, and five of those 16 are ones we are suing them on in the ITC seeking an exclusion order." Qualcomm in July asked the ITC to ban the import and sale of iPhone 7 and iPad models that allegedly infringe on a set of six patents. Notably, the complaint was limited to devices using Intel modems instead of those built by Qualcomm and its sub-contractors. With its new ITC complaint, Qualcomm is looking to include Apple's recently released iPhone 8 and iPhone X units in the potential ban. The company is once again limiting scope to devices that use Intel cellular communications hardware.